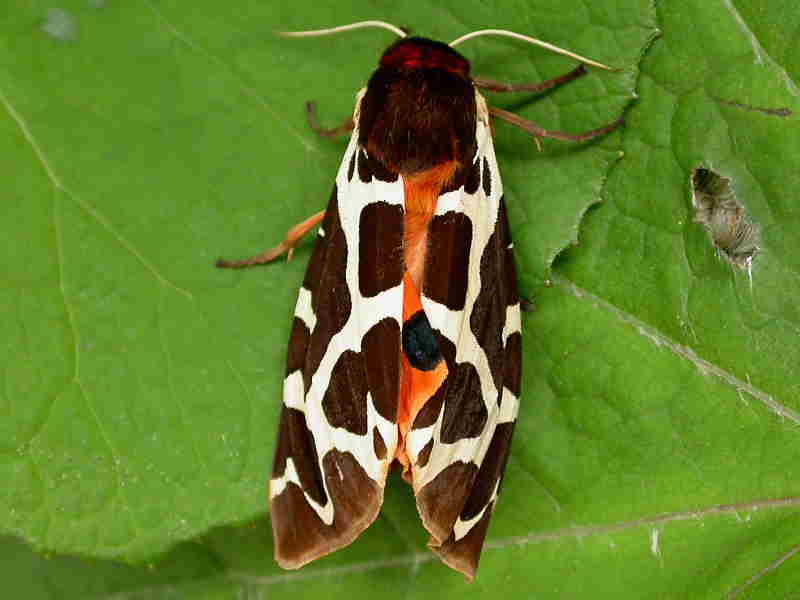 The Garden Tiger Moth is a dramatically colourful species found throughout much of the British Isles, Northern Europe, North America and Northern Asia. In the British Isles it occurs commonly in gardens and open countryside although in recent years numbers have declined alarmingly . 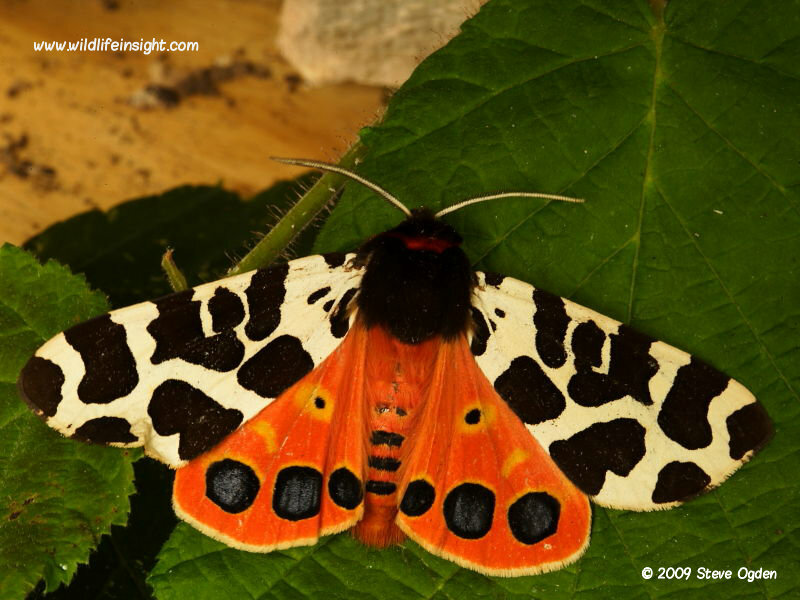 The image shown below left of six Garden Tigers attracted to light in a Cornish garden is becoming an increasingly rare sight these days. 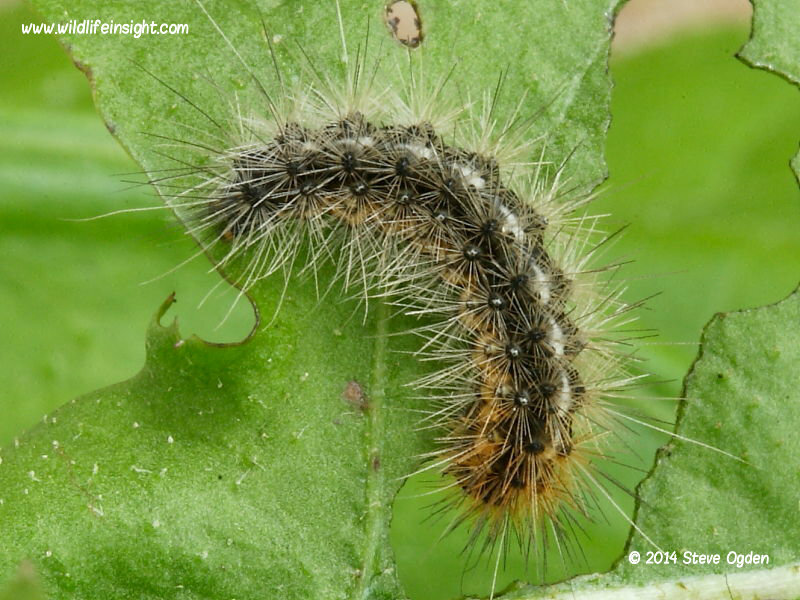 The caterpillars feed on a wide variety of low growing herbaceous plants such as dandelion, dock and plantain. 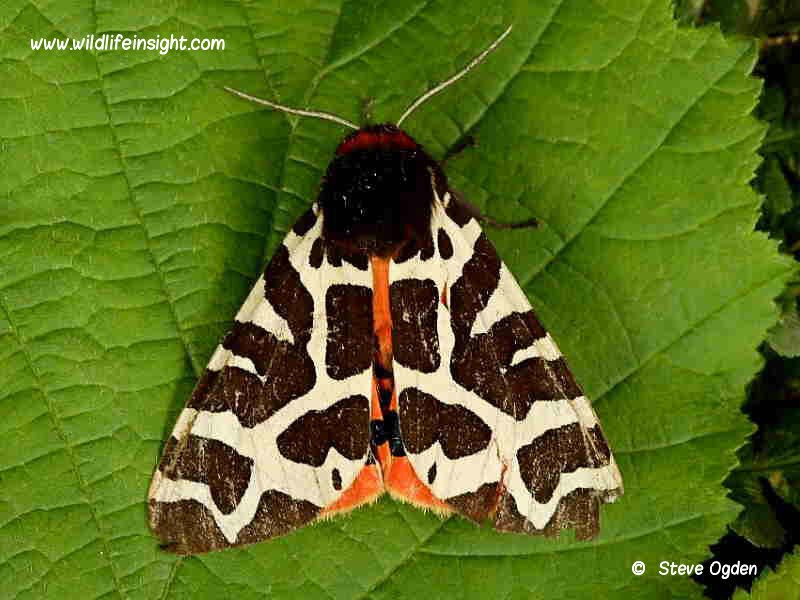 The Garden Tiger has a wing span of about 65mm and easily identified. When seen in a natural resting position the pale trellis of lines set against a uniformly dark brown wing is distinctive. 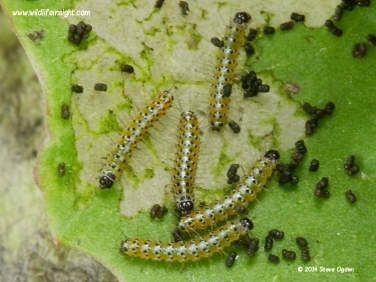 Aberrations and known forms such as f.lutescens with yellow hindwings, f.petriburgensis with black marking on a white forewing and f. fumosa a brown form do occur. When feeling threatened the moth opens its wings and displays bold red hindwings with dark blue spots as a warning that it is distasteful. Should a predator attack then it secretes a yellowy fluid from a gland behind its head. 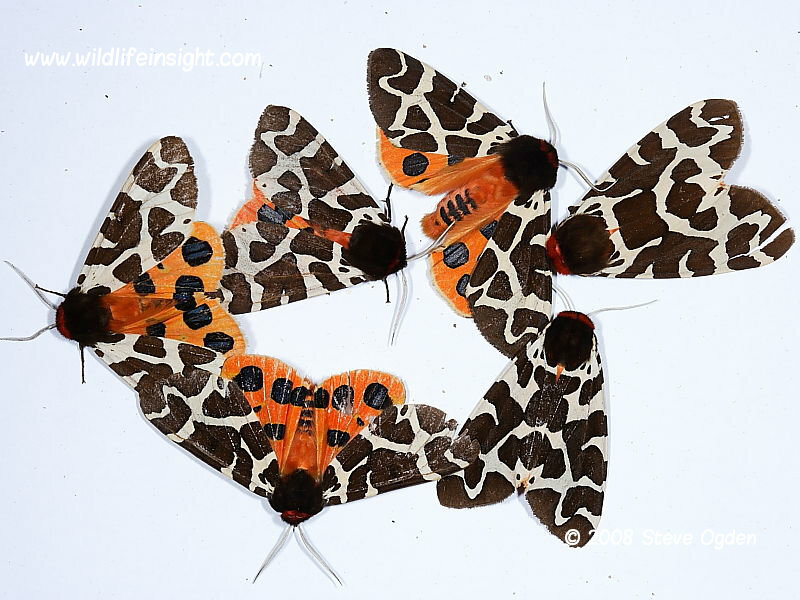 There are three other Tiger moths of similar size to the Garden Tiger Moth in the British isles, the Cream-spot Tiger, The Scarlet Tiger moth and The Jersey Tiger moth. These can usually be easily identified by the different patterns on both fore and hind wings. 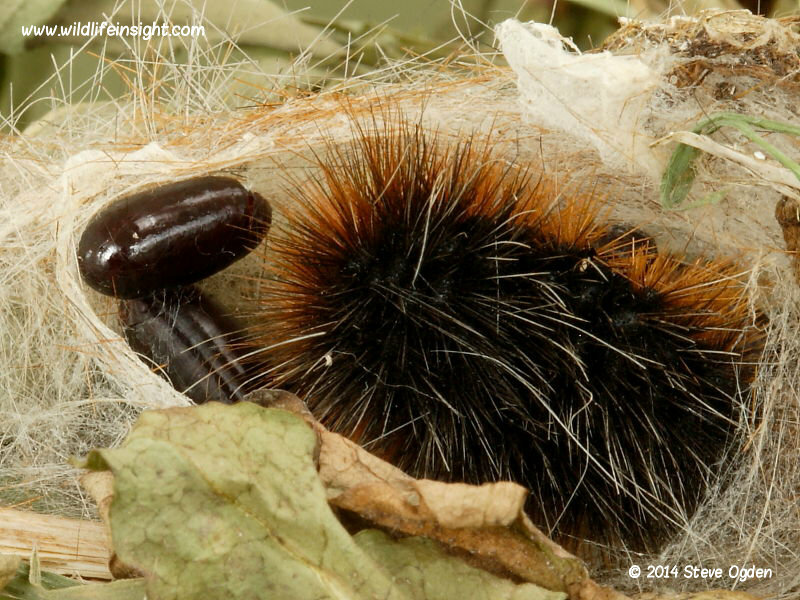 In the British Isles The Garden Tiger caterpillar is also known as the Woolly Bear. 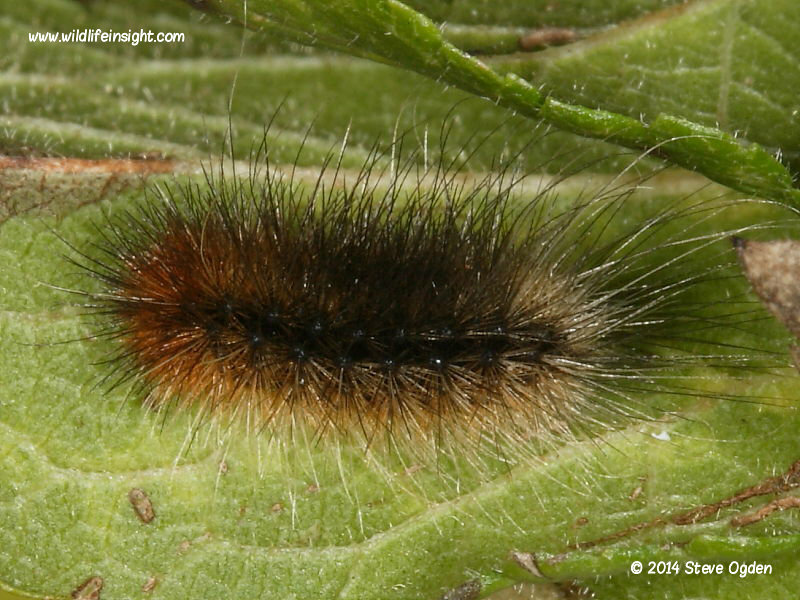 In many States of North America several of the other species of caterpillar belonging to the same Arctiidae family are also referred to as woolly bears. When fully grown it is about 60mm long with a black head, long white hairs set amongst a dense layer of shorter black and ginger hairs with a line of small white spiracular spots. 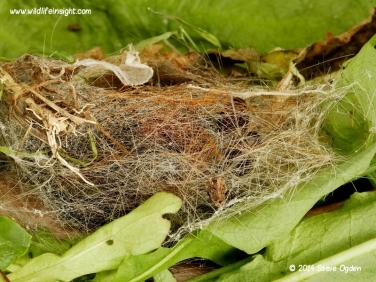 The hairs act as a deterrent to birds and provide some protection against parasitic flies and wasps. 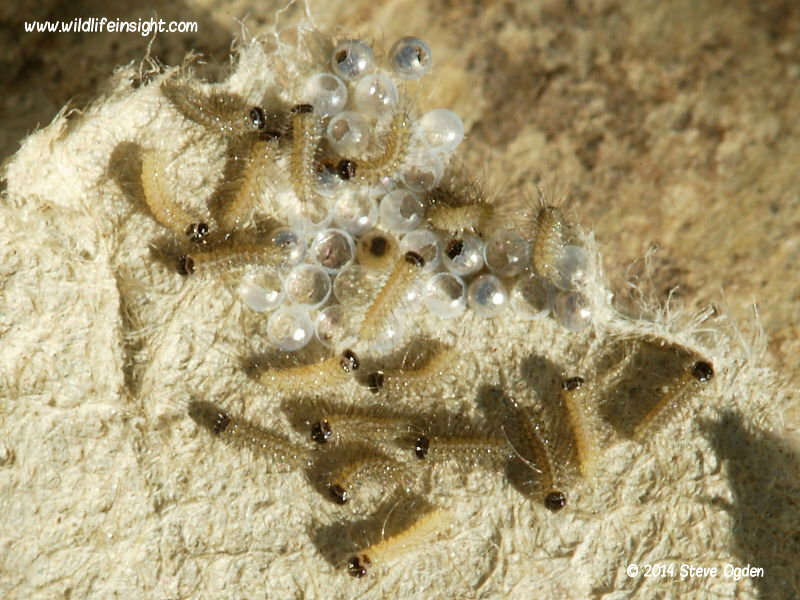 The adult moth flies at night in a single generation between July and August when they are attracted to light. The female lays batches of 50 or more eggs on the leaves of a wide variety of herbaceous plants.Those shown below were laid on an egg carton inside a moth trap and reared through. The caterpillars overwinter when about 15mm long. 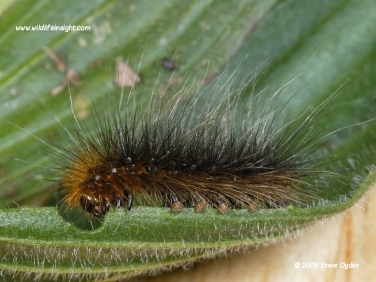 They resume their growth in the Spring when they be found during the day on the food plant. 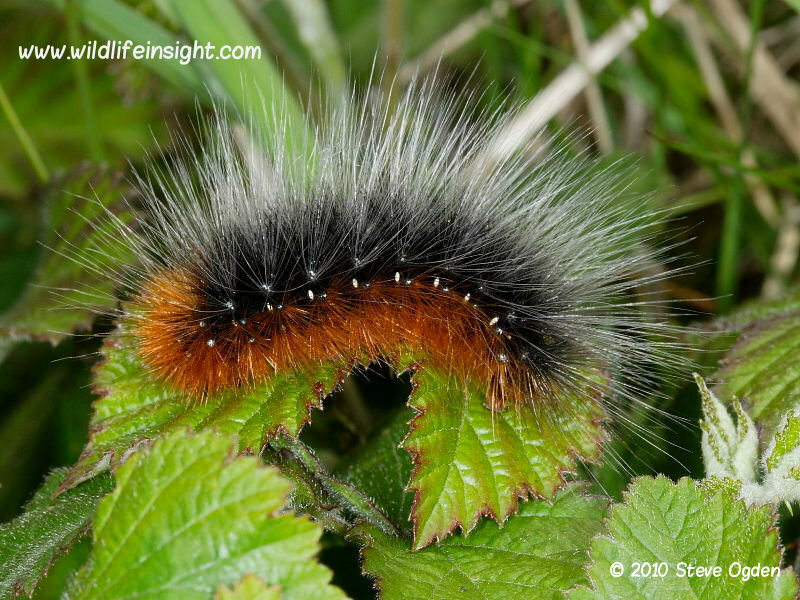 In the south, during warm Springs, some caterpillars are fully grown by the end of April and most by the end of May. Prior to pupating they are often seen basking in the sun or wandering across paths in search of a suitable place to pupate. Pupation takes place inside a cocoon spun amongst low lying vegetation and leaf litter using the caterpillars own hairs and spun silk . 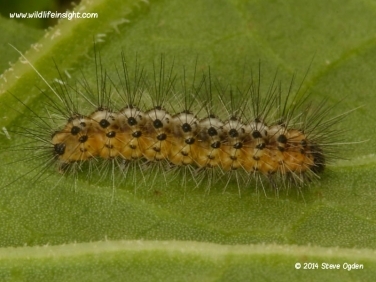 The adult moth emerges in 2-4 weeks depending on temperature. 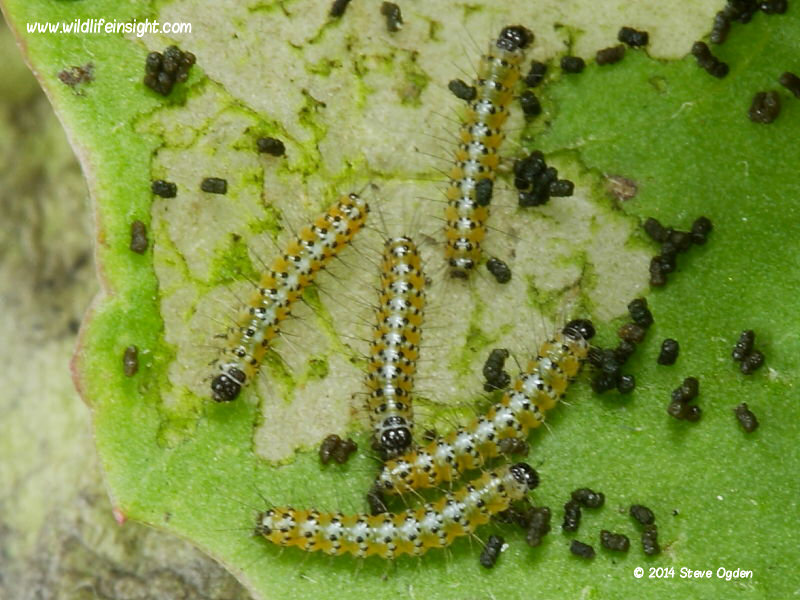 However, despite the caterpillars protective shield of long hairs, they are frequently attacked by parasites and the cocoons of late instar caterpillars collected from the wild may produce parasitic fly larvae. 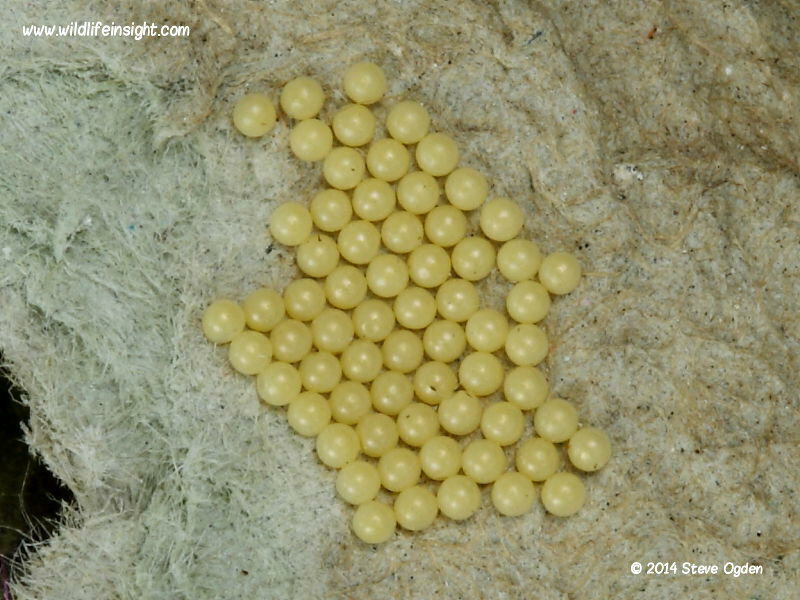 The image right shows the inside of a Garden Tiger cocoon in which parasitic fly larvae have emerged from the caterpillar and pupated. As with all hairy caterpillars care should always be taken if handling as their hairs can cause irritation. 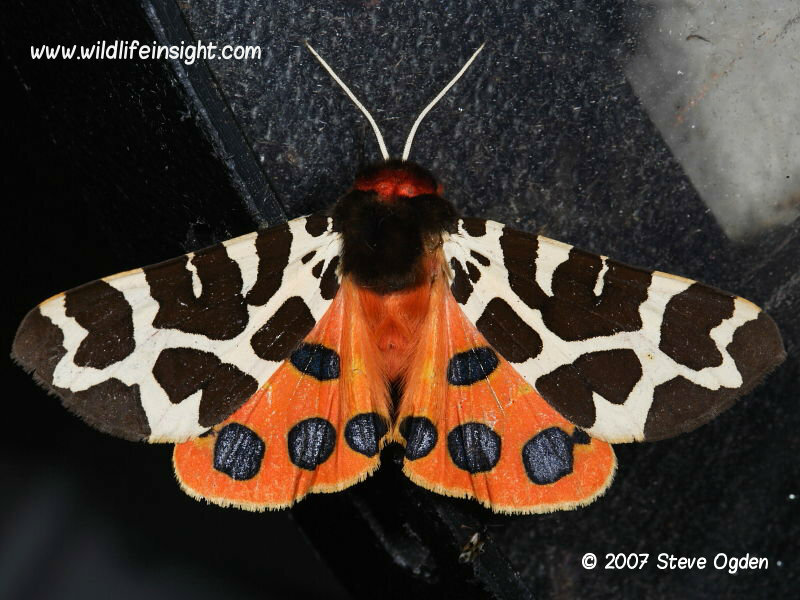 The adult Garden Tiger moth exudes a smelly liquid from a gland at the back of their head as a deterrent to predators.